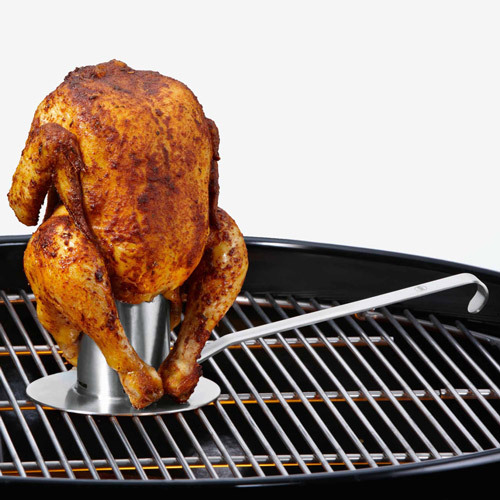 The Rosle Chicken Roaster succulently roasts American-style beer can chicken on a covered grill or in the oven. Topple-free cylinder stands upright to hold 8 oz. of your favorite beer, wines, marinades and other flavoring liquids so chicken, duck and game hens turn out unbelievably tender and juicy. Vertical chicken roaster ensures the meat inside stays moist while the skin roasts to golden, crispy perfection. Handle easily detaches until you’re ready to transfer the roast chicken and poultry for serving. Durable 18/10 stainless-steel with safe, stable base. Compact and easy to store. Dishwasher-safe. Founded in 1888, Germany’s Rosle metal crafting and engineering company began producing professional culinary utensils and tools in 1920. The Rosle vertical chicken roaster continues in the Rosle tradition of premium quality, function and design in every product.